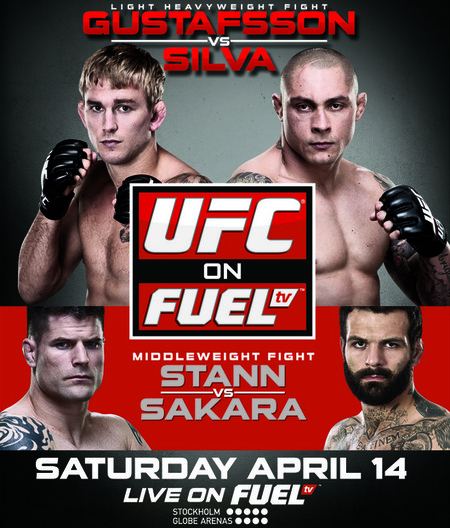 “UFC on FUEL TV: Gustafsson vs. Silva” is officially jumping off inside Ericsson Globe Arena in Stockholm, Sweden. Light heavyweight Alexander Gustafsson (Pictured) headlined the festivities in front of his hometown peeps against Thiago Silva. The 205-pounders battled in a three-round affair. A middleweight tussle with Brian Stann and Alessio Sakara served as the event’s co-main attraction. 1stRound: Not much action to start things off. Young secures a takedown, but isn’t able to inflict much damage. He lands some leg kicks while standing over Wisely. Young plants him on the mat again after Wisely misses on a head kick. Young unleashing solid ground-and-pound. Young, 10-9. 2ndRound: Young trips him to the canvas again and just misses on a big right bomb as he dives into Wisely’s full-guard. Wisely works his way to his feet. After some jousting, he’s lead right back to the ground. Young, 10-9. 3rdRound: Wisely comes out with a greater sense of urgency and briefly wrestled Young to the canvas. Wisely is opening up offensively, though he’s down 2-0 and will need a finish. Young lands a takedown and is starting to unload shots. Young, 10-9, and sweeps the cards, 30-27. 1stRound: Thoresen finally scores a single-leg takedown, but ate a lot of damage for his efforts. Yousef is active off his back. Thoresen answers with several short shots of his own. Youself works his way back up and tags him with punches and knees in the clinch. Close round. Thoresen, 10-9. 2ndRound: Yousef is on the attack and connects on a short right. Thoresen stuns him with a shot of his own and attempts guillotine choke. Thoresen advances to full-mount and is bringing the pain. He now takes Yousef’s back and locks in a rear-naked choke. That’ all she wrote. 1stRound: Madadi immediately takes him to the mat and instantly goes for a north-south choke. Izquierdo fights his way to his feet and is unleashing several big strikes. They clinch against the fence. Madadi floors him just before the horn sounds. Madadi, 10-9. 2ndRound: Madadi secures a takedown just seconds into the middle stanza. Madadi slaps on a guillotine choke and Izquierdo is forced to cry uncle. 1stRound: Carmont plants him on the mat less than a minute into the scrap. Cedenblad works his way up and now slams his opponent to the ground. He now advances to full-mount and now takes his back. Cedenblad is unloading some shots to his dome, nothing too lethal. Carmont turns the tables and takes full-guard just before the horn blares. Cedenblad, 10-9. 2ndRound: Carmont comes out like a house on fire and puts Cedenblad on his back. He moves to full-mount and is bringing the pain. Cedenblad gives up his back and is eating countless bombs. Carmont locks in a rear-naked choke. It’s a wrap. 1stRound: DeBlass working hard for a takedown and finally secures it. DeBlass advances to side-control. Not many strikes thrown. Pretty boring frame, as the crowd boos before the horn sounds. DeBlass, 10-9. 2ndRound: Diabate throws a kick, but DeBlass catches it and immediately plants him on his back with more than four minutes to go. This round could very well mirror the opening stanza. Diabate now gets to his feet and puts DeBlass on the ground. DeBlass reverses and regains control on the ground. Diabate moves to top position and is dropping the first serious series of ground-and-pound of the match. Diabate, 10-9. 3rdRound: DeBlass appears gassed. Diabate scores with a one-two combination. He follows up with a knee to the midsection. DeBlass goes for a desperation leg lock to no avail. He manages to reverse with a 75 seconds to go. Diabate explodes back to top position. Diabate, 10-9, and rallies to win, 29-28. 1stRound: Abedi puts his opponent on his back. Head gets to his feet and comes out firing. He’s tagging Abedi with several punches to the dome and Abedi falls to the mat. Head takes his back and locks in a rear-naked choke. Game. Set. Match, Head. 1stRound: Both come out flinging leather early. Page slips and Pickett jumps on top of him for a brief second. Page picks him up and puts him to the ground. Pickett now slams his opponent to the mat. Pickett is nailing him with several punches to the grill. He is very aggressive with his ground attack. Page wiggles free, but gets planted back down after attempting an arrant flying knee. Pickett clobbers him with a right hand. Pickett, 10-9. 2ndRound: Pickett scores with a quick slam. He drops Page with a vicious left hook and pounces. Page is doing a good job of fending off the assault, but gives up his back and is eating countless bombs. Pickett attempting a guillotine choke, though Page escapes and ends up on top. They are back to their feet, which isn’t a good idea for Page as he’s getting clocked with left hands. Pickett latches on to a rear-naked choke and Page is forced to quit. 1stRound: After taking a couple of inside leg kicks, Maguire lands a takedown. Johnson immediately goes for an omoplata, then tries an armbar. Maguire doing a good job of controlling his opponent on the ground. He advances to Johnson’s back, but there’s only 20 seconds left in the frame. Maguire, 10-9. 2ndRound: Maguire gets him down within seconds, though Johnson manages to turn the tables. He advances to side-mount. They are back to their feet. Maguire eats several powerful leg kicks. He plants Johnson on his back, though “Darkness” is very active by throwing elbows from the bottom. Johnson was attempting a kimura from his back, but Maguire counters and jumps to an armbar. Johnson has no choice but to tap. 1stRound: Siver connecting on numerous kicks to start things off. Nunes eats a shin to the face. Plenty of fancy kicking in the opening five minutes by both featherweights. Tough round to score, but Siver seemed to land more shots. Siver, 10-9. 2ndRound: Nunes connects on a spinning-wheel kick to the head. Siver scores on a one-two combo. Siver unsuccessful on two takedown attempts in this stanza. Siver is starting to open up his attack on the Brazilian. Siver, 10-9. 3rdRound: Nunes rocks him with an overhand right. Siver appears to have recovered. Siver is much more active with his assault. Siver is now gushing blood from below his left eye, tough to tell how the damage occurred. Siver marches forward and briefly knocks his opponent to the ground. Another tough round to score. As with the other frames, this one could have gone either way. Nunes, 10-9, but Siver takes the fight, 29-28. 1stRound: The middleweights are exchanging bombs early. Stann eats a one-two combo, but answers with a big right hand. Sakara is rocked. Stann drops him with a couple of knees to the mug while in the clinch and pounces. Stann unloads a few short lefts and stops his assault to let the ref know his opponent is asleep. 1stRound: Silva charges the center of the cage, appearing like he’s ready to kill someone. Gustafsson floors him with a short right uppercut and pounces. Silva survives the onslaught, but has blood flowing from his forehead. Silva answers with a big right of his own. Gustafsson is doing a solid job at keeping the Brazilian at bay with his reach. Gustafsson, 10-9. 2ndRound: Gustafsson tosses him to the canvas and is now standing over him. The Swede confusing Silva by mixing up his strikes and changing levels. Gustafsson comes with a barrage, capped off by an uppercut. Silva scores on a solid right hand. And another. Gustafsson tags him with a front kick to the grill. Gustafsson, 10-9.